Rightfully so. 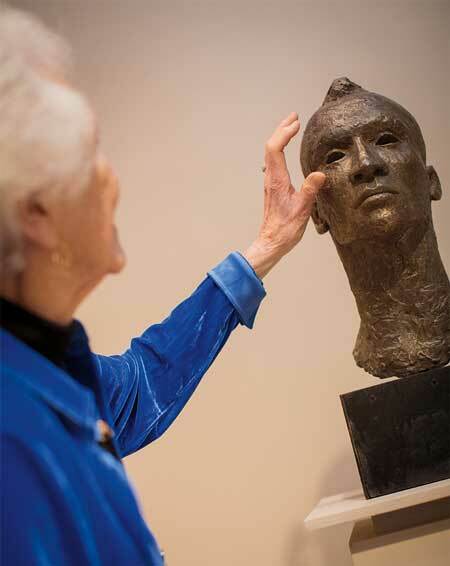 Schön (pronounced “Shern,” a name with more Hungarian than German roots, she says) is a world-renowned sculptor, born in Boston and raised in Newton, Massachusetts. Her public art covers the globe from Boothbay Harbor, Maine, to Tel Aviv, Israel. Families flock to her iconic bronze sculptures of Mrs. Mallard and her ducklings in the Boston Public Garden, a tribute to the beloved children’s book “Make Way for Ducklings.” (There’s a Mallard family in Moscow, too.) Campbell and Cutter remember playing on the Boston ducklings as children. Who knew that a graduate college course would lead them to the very artist who helped cultivate their childhood memories? 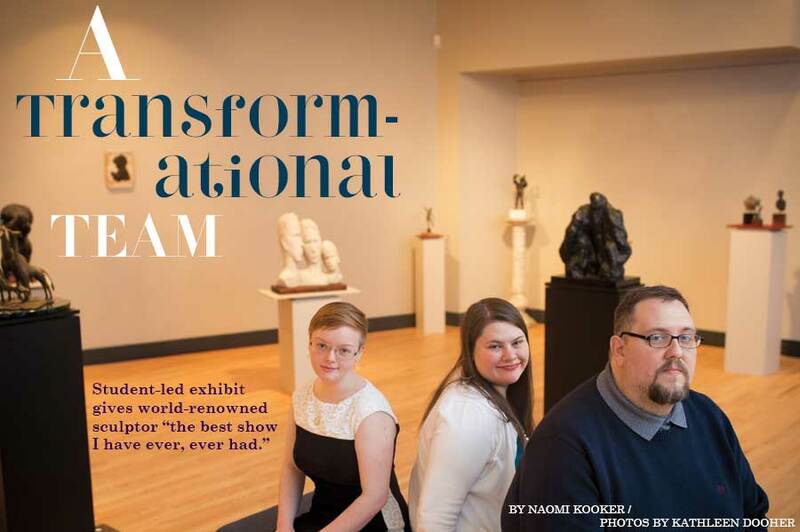 The unlikely trio—Campbell, 21, Cutter, 22, and Moore, 41—had one assignment for their graduate Museum Studies Practicum with professor Kathryn “Kate” Edney, PhD: to curate a themed exhibit for the university’s Carney Gallery in the Fine Arts Center. An exhibit is not unlike a live performance. There’s the behind-the-scenes process, then the curtain goes up. No turning back. Past practicum exhibits drew on artifacts and archives; here was a living, prolific, famous artist with whom the students had to work. Schön, 88, had never done anything like this before, either—essentially letting strangers into her home to select pieces to show and then decide, for the exhibit, what goes where. She had an exhibit at Regis in 1977. But this was entirely different. The only certainty was the exhibit’s theme, “metamorphosis,” and the looming deadline to pull it together for a 2017 spring semester opening. “[Nancy] took a leap of faith working with the students,” says Edney, who, along with teaching the practicum, is the graduate program director for Heritage Studies, an assistant professor in the Department of Humanities, and associate dean of academic assessment at Regis. Schön calls the experience an adventure. “That’s part of the excitement of life,” she says. “Not knowing what’s coming up.” This September Schön will publish her first book about her work and public art. The students wanted the exhibit to look professional, not like it was put on by, well, college students. Ultimately, they wanted Schön to be happy. An exhibit is not unlike a live performance. There’s the behind-the-scenes process, then the curtain goes up. No turning back. That’s what happened at the opening reception February 16. All gathered awaited the artist’s remarks. 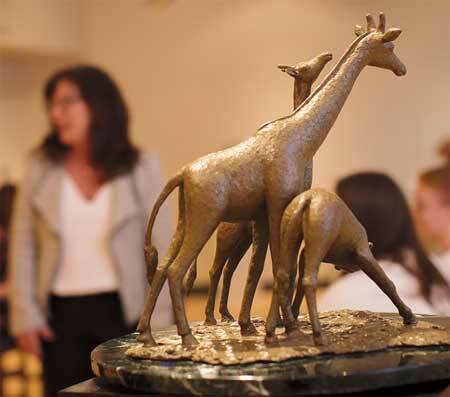 “Metamorphosis: The Art of Nancy Schön” contains 36 pieces, sculptures cast in various mediums, that span Schön’s life in ways no exhibit of hers has to date. There are personal pieces that have never been shown, pieces from her high school days, and “Butterfly” (2017 bronze) suspended in air, cast for the exhibit. Campbell’s mother, Kim Campbell—a registered nurse and a graduate student in Regis’ nursing program—saw the exhibit not only to support her daughter but because she says such an exhibit is a “critical” complement to the sciences. When the students walked into Schön’s imposing Victorian house last September, they were excited and nervous. Her sculptures were everywhere. 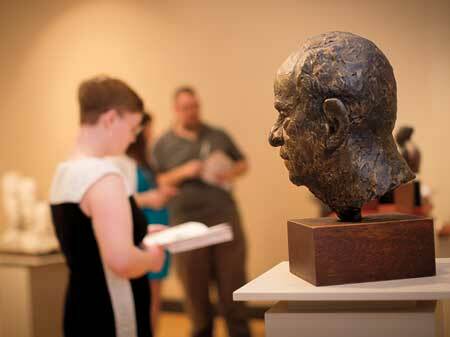 “I remember being very worried about how delicate the artwork might be,” says Campbell. Soon the talk turned to the exhibit. Schön led the students on a grand tour of her home and studio, pointing out pieces—a bust of her father, a horse’s head—that she liked. Her epiphany gave the students direction. With each trip to Schön’s house (there were about four), the students deliberated back and forth about what to include and why. One of those was “Balancing Boy” (1974 bronze)—a small figure of a boy catching his balance with outstretched arms. The right hand is missing. “She didn’t think anyone would want to see it because it was damaged,” says Cutter. But the students liked it because it shows Schön, a mother and grandmother, as a proud mom because the statue is modeled after her son when he was a young gymnast. Eventually they grouped like objects together: the interpretive or metaphoric pieces at the beginning; people, including busts and figures, next; then the animals. “Raccoon” (1995 bronze) is the one piece you’re allowed to touch, a hallmark of Schön’s public art. If a piece didn’t make the cut, it was likely too delicate. “She definitely uses her art in almost a social-activist way,” says Moore. The students saw that. Moore points to “Mephistopheles” (1957), a pitchfork-and-chain welded metal piece. “She made that while in a camp in Maine,” he says. “It’s such a departure from everything we see from her.” She used pieces from a junk pile and welded them together with a blowtorch. “That piece speaks to me,” Moore says. For the students, the show was about coming together over hundreds of decisions—what color should the pedestals be? How far apart should the sculptures stand? Before the opening reception, Cutter, Campbell, Moore, and Edney take a breather with Schön. She compliments the young women, decked out in dresses and heels. “Don’t you look gorgeous, you two.” Turning to Moore, she adds: “And handsome! Did you shave?” she teases. The triumph of the evening gives everyone pause; rest, finally, and a moment to reflect. 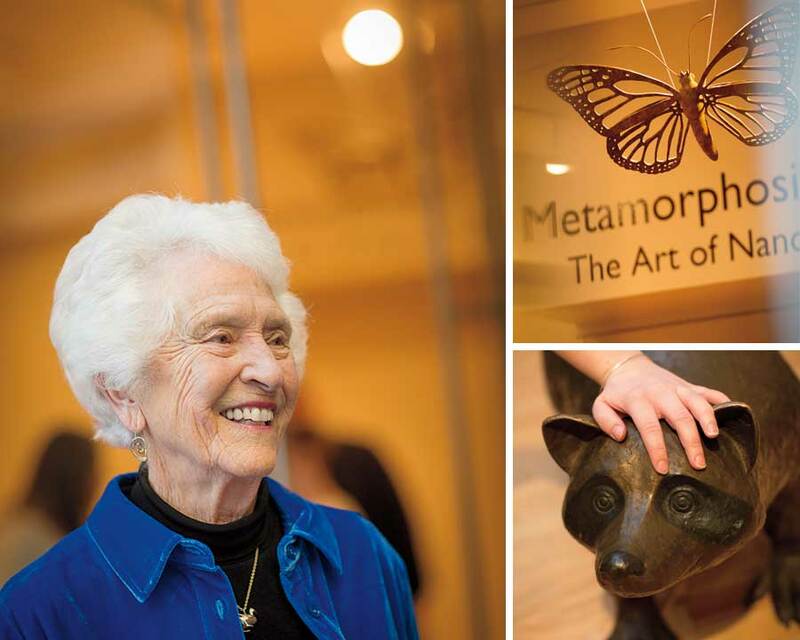 “Metamorphosis: The Art of Nancy Schön” ran from February 16 through May 9 at the Regis Fine Arts Center Carney Gallery.